We've introduced our HP series to satisfy the needs of customers with larger rooms and those who want greater bass impact. Our HP subs offer two advantages when compared to our other subs. The first is 2 dB higher output. At bass frequencies, every 6 to 10 dB increase sounds twice as loud (the actual number varies with listeners). So the 2 dB increase with our HP series will sound around one third louder. The second benefit is an increase in perceived authority and impact. When a subwoofer amplifier reaches it's limits, clipping occurs. This tends to reduce the dynamics and authority of the sound. 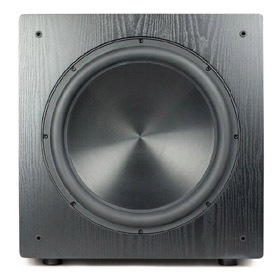 Our HP subs can play cleanly where our other subs are operating at their limits. The difference is felt as much as it is heard. There are other "brute force" subs on the market, but what our HP series achieve is a combination of brute force and finesse. Now the articulate and dynamic bass that our other subs have become known for is available with greater punch. 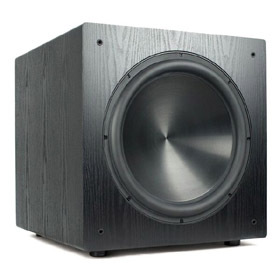 All our subwoofers use our patented Direct Servo technology, providing high end performance at an affordable price. It allows us to use lighter and more efficient drivers and still achieve deep bass without using excessive amounts of power. The servo reduces memory effects, counteracts thermal compression and various forms of driver non linearities. You can read about Direct Servo in more detail in our technology section. F15HP uses our new high power H600PEQ3 servo amplifier and DS1510 driver. DS1510 features anodized aluminum cone, a 3" voice coil, and 200 oz magnet. Its linear excursion range has increased to +/- 20mm (from +/-15mm of DS1501). The entire subwoofer is 12lbs heavier. The quickguide of the PEQ3 amplifier for sealed subs can be found here . PEQ3 amps do not have high pass filter RCA output. The response curves with various extension frequency/damping combinations of both amplifiers can be found in our EQ page. The feet are sold separately. Black cones are made of anodized aluminum. Price includes shipping to 48 US continental states only. Shipping to other region or country should inquire us for actual cost. Black oak and black matte are on sale for $1282. Our subs can be placed directly on carpet floors or matching spike feet are available. These are 1.2" in diameter and 1.75" in height. The thread size is M10. Spike feet are not recommended on hard surfaces where we recommend the standard rubber feet which inlcuded in our subwoofers. Free shipping in the shopping cart is only valid when ordered and shipped with subwoofers.